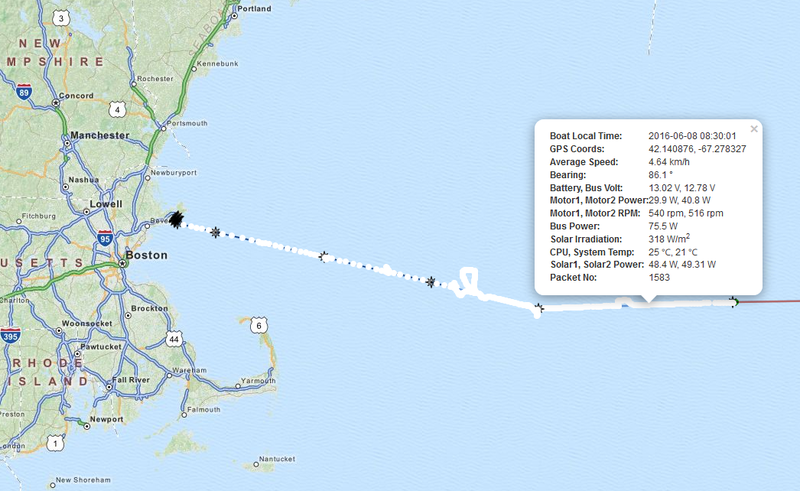 About 200 miles due east of Boston, a robotic boat is putting along at a walking pace on what could be an historic journey across the entire Atlantic. “Solar Voyager,” built by two friends in their spare time, would be the first autonomous vessel to cross that ocean — and the first one to cross any ocean using solar power alone. Isaac Penny and Christopher Sam Soon have been tinkering away on the project for four years now and, while the craft, which they launched on June 1, still has a long way to go, it’s safe to say it’s already a success in many ways. Nevertheless, the two built Solar Voyager from scratch, with only the solar panels and some standard motor parts taken off the shelf. The 18-foot boat is slowly making its way between GPS waypoints and, if all goes well, it should arrive in Portugal this fall. 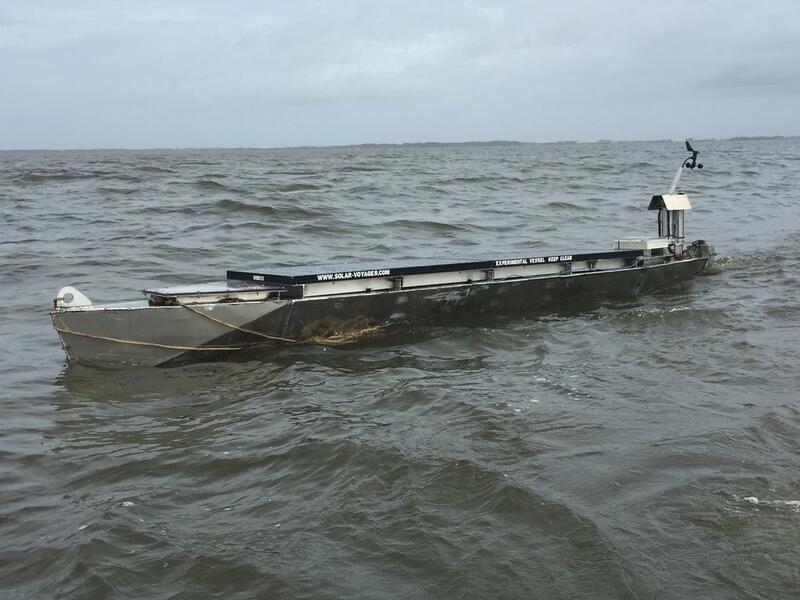 The craft isn’t the first autonomous boat to cross an ocean — Liquid Robotics and its Wave Gliders were the first to do that back in 2012. But those harvested wave energy to move, not solar, and, as Penny pointed out, the project was funded and staffed by a major, experienced company and the resulting technology was patented. “Only Liquid Robotics can build a Wave Glider, but anyone can do what we did. We don’t even have a garage!” laughed Penny. Over the last four years, the boat evolved from a jury-rigged plastic kayak to a full-on custom aluminum hull with home-made, home-tested propulsion and electronics. It has a 280-watt solar array, a specially made fouling-resistant propeller, a barnacle-resistant coating and a whole lot of small design tweaks to keep the thing running for the four months it should take to get where it’s going. They have to get it right the first time, because it’s their only chance. Unlike Liquid Robotics, they can’t build a fleet or set up a waypoint halfway to Lisbon where the craft can be serviced. If the motor breaks down or the batteries fry, that’s four years and somewhere north of 10 grand down the drain. And that’s if a shark doesn’t attack it or an oceanliner doesn’t smack into it — the boat is radar-visible and painted to be highly visible, and it avoids shipping lanes, Penny noted. Once it arrives in Portugal, Solar Voyager will circle its final waypoint until Penny and Sam Soon can go collect it. “We’re actually looking for people in Lisbon who own a boat. That’s probably not something people want to read about in tech news,” he added. But it’s a charming reminder that this is the work of a couple of guys in their spare time, not a sponsor-studded XPRIZE entry or Navy-backed prototype. So, Portuguese TechCrunch readers out there, get in contact with the Solar Voyager guys if you want to help them out. More than anything, the project is aimed at promoting the suitability of solar power for this sort of endeavor. You can track the progress of Solar Voyager at the project’s website; it updates its location and vital statistics every 15 minutes. Check back in October when, hopefully, Penny and Sam Soon will be celebrating the craft’s successful transit — and a little bit of history being made.